Somewhere, some time ago, some couple thought of securing a padlock onto some chains to wish for or to declare the solidarity of their love. 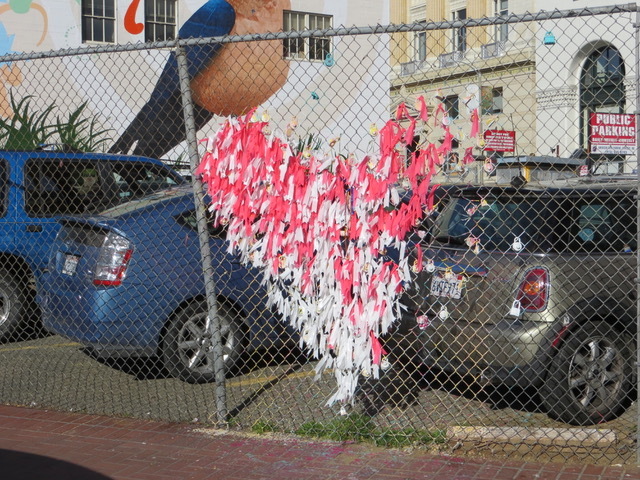 This act of love lock has spread and is practiced in many places. 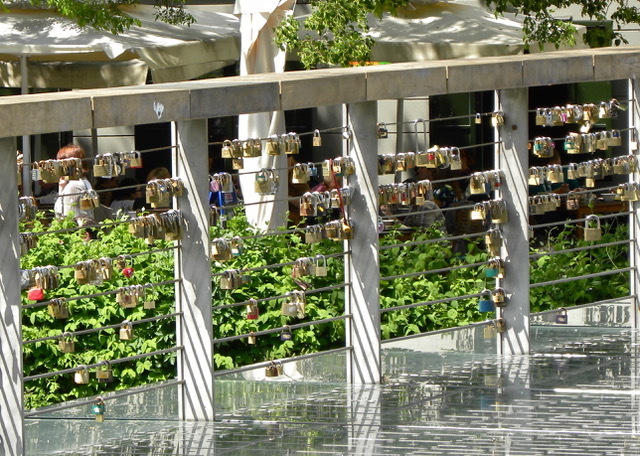 These seemingly identical locks were neatly lined up on a bridge in Ljubljana, the capital of Slovenia. The tour guide pointed out that Slovenia is the only country whose name includes “love”. 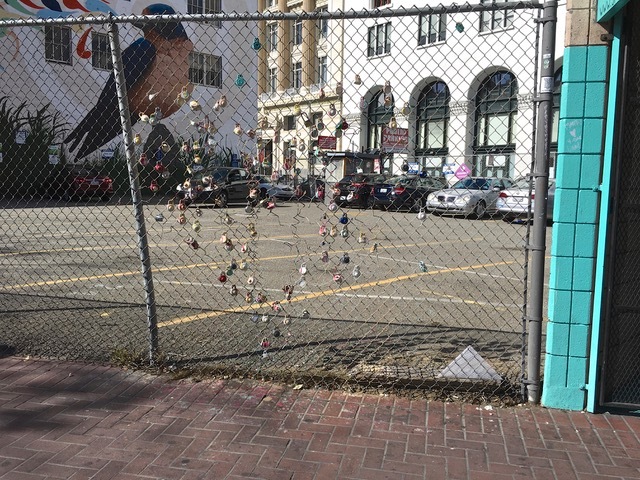 These love locks were apropos there. 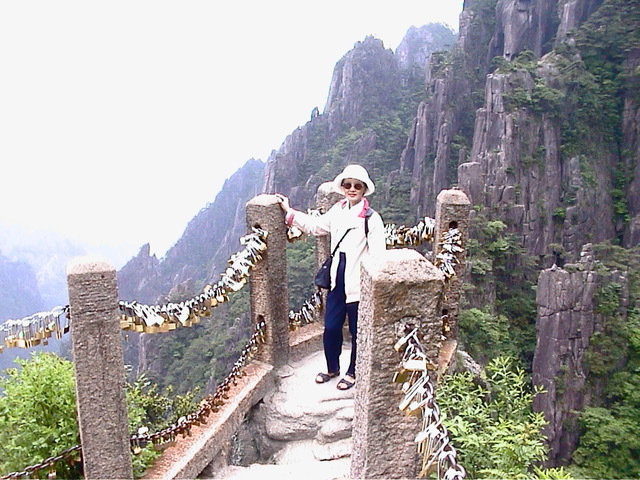 As we walked gingerly along the precipitous edge of HaungShan Mountain 黃山, the guard chains were loaded with hundreds of love locks. Chinese lovers vowed in this eternal mountain to dedicate the permanence of their love 山盟海誓. I wish them the best. 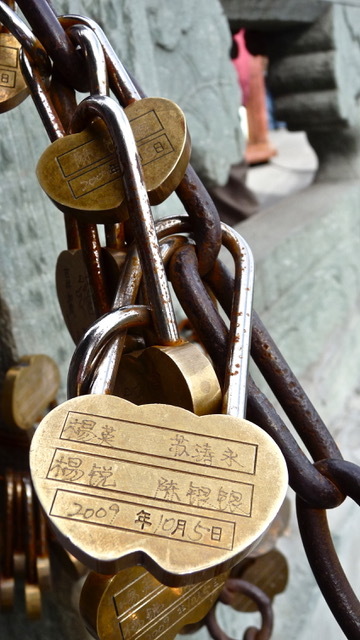 In the Taoist temple on the peak of WuDang Mountain 武當山, merchants sold heart-shaped love locks. Names were engraved onto them, for a fee, and the lovers were memorialized in brass. But I am still puzzled why this lock has four names. 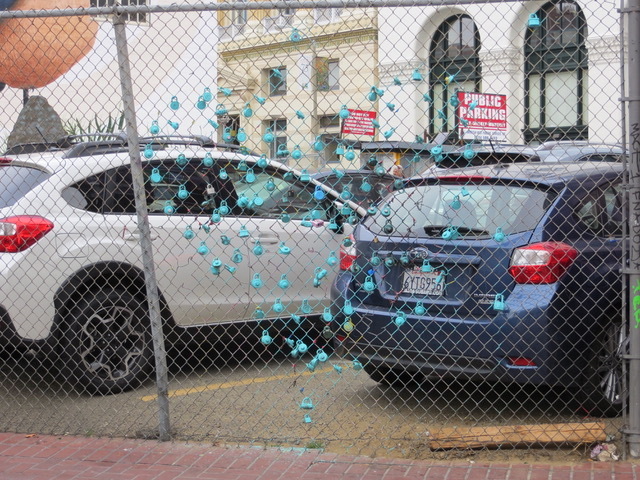 In San Francisco, Sally and I pass by this street corner when we go to the ceramics studio in the senior center. 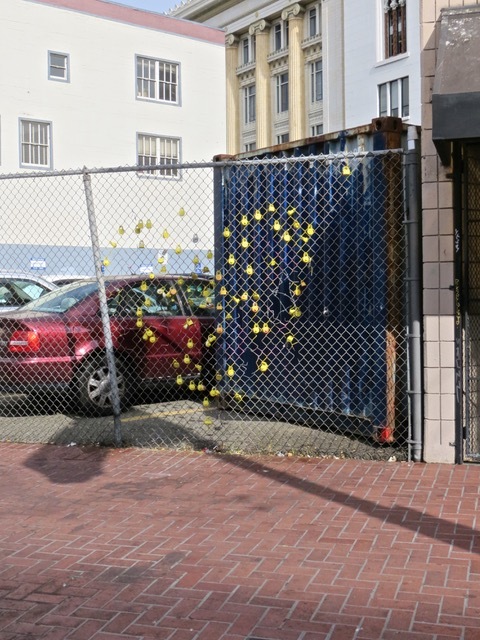 I noticed this heart of yellow combination locks on a chain link fence. A year later, I noticed the locks were painted blue. 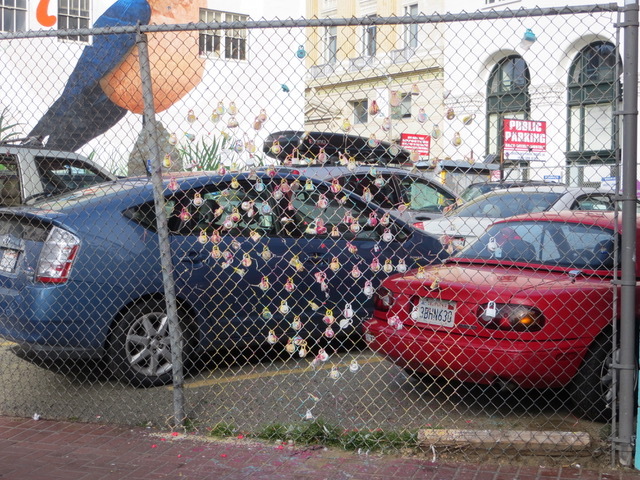 Apparently these locks were the creative medium of some anonymous local artists. A beautiful mural was also painted on the building in the background where many artists set up their studios. 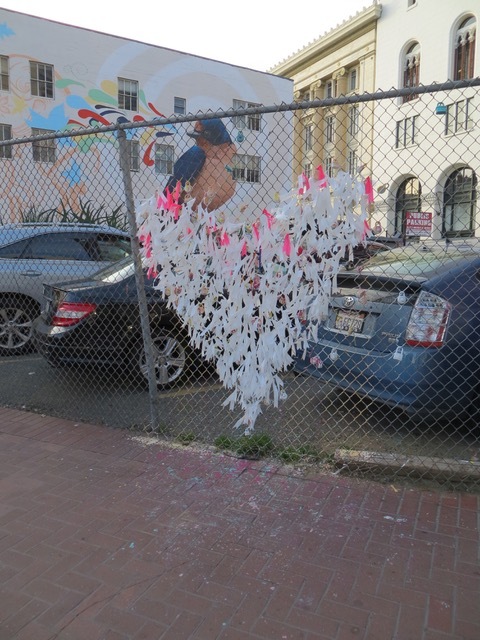 To celebrate Valentine’s Day (February 14) in 2016, the locks were painted over and white paper strips were tied to the fence to decorate the heart. 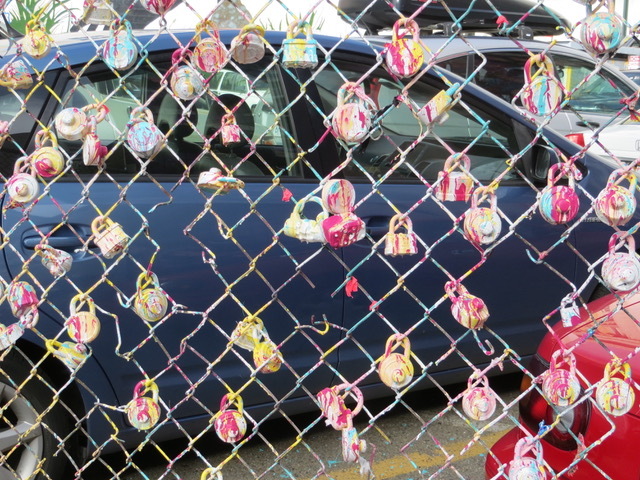 Somebody wanted to liven up the heart and added red paper strips to the white, obscuring the locks. The Valentine’s Day exuberance was short-lived. One week later, all the paper strips were removed. Freed of the cover, the locks were revealed to be gayly splashed in multi-colored pastel. After six months, the pastel paint on the locks faded into dull, drab reticence. 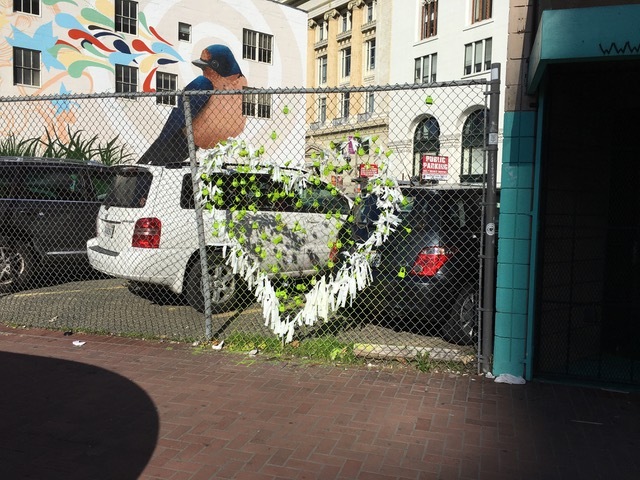 Also, somebody vandalized the fence and cut a four-foot hole through the chain link heart. 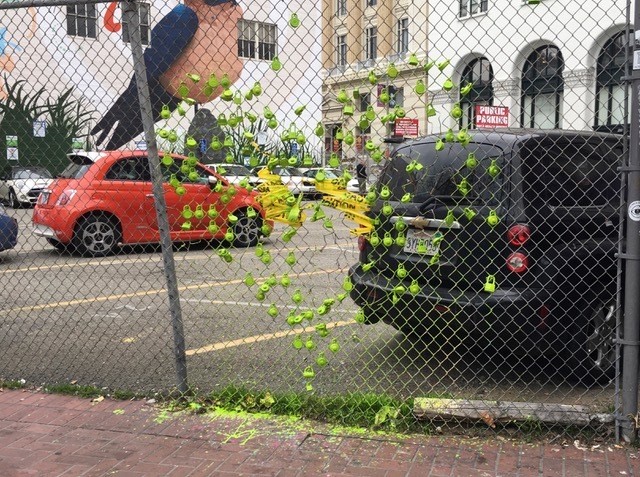 The anonymous artists prepared for Valentine’s Day 2017 by painting the locks lime green. They also repaired the fence by weaving it with wires. They seem to signify their pain of the broken heart with yellow tapes. The artists completed the decoration with white outline of the heart. But the broken heart was still sad with the yellow tapes. By Valentine’s Day, the artists apparently decided to stop mourning the damaged heart. The yellow tapes were removed and the green and white heart appeared healed. 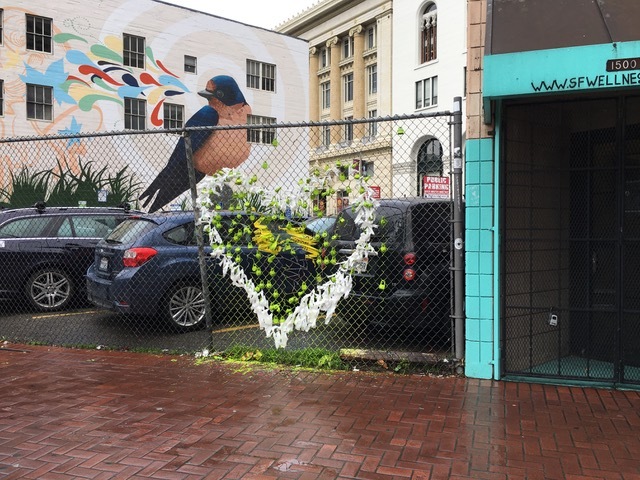 As this saga of this fence heart evolves, I will keep watch and record the creations of the anonymous artists. Posted by Robert Wu on Saturday, March 18, 2017, at 6:34 pm. Filed under Uncategorized. Follow any responses to this post with its comments RSS feed. You can post a comment or trackback from your blog.